GrowFL was created in 2009 by the Florida legislature as an economic development program to assist second-stage growth companies prosper in the state of Florida. The Florida Companies to Watch program was developed by the Edward Lowe Foundation as a unique way to recognize and honor companies that demonstrate high performance in the marketplace with innovative strategies and processes, making them “worth watching” as major contributors to the ongoing economic development of Florida. The Florida Companies to Watch award is judged by a selected panel and based on the following criteria: growth in number of employees, impact of the business in the job market, increase in sales and/or unit volume, financial growth, innovativeness of the product or service, response to adversity and the contributions by the company to aid community-oriented projects. 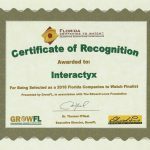 "On behalf of all of us at Interactyx, we are honored to be recognized by GrowFL, the Florida Economic Gardening Institute and the Edward Lowe Foundation as a 2016 Florida Company to Watch finalist. We also wish to thank the Lee County Economic Development Office for their support over the years," states Alfred R. Novas, Chief Executive Officer of Interactyx. "We are pleased to call Lee County and Southwest Florida our home for the past decade. We expect to continue to grow our international software development company and contribute to the economic ecosystem here in Florida."